Take your riding experience to the next level with this biker handlebar bag. While other bike bags can interfere with your gears or make it too difficult to access your phone while riding, this pannier has a sleek design that won't get in the way of your gears or pedals and gives you easy-access to your device. Use the touch-screen viewing pocket to view Google Maps or GPS, listen to music or make hands-free bluetooth phone calls. Store essentials like your wallet, bike lock and repair kit, or an on-the-go snack in the spacious u-zipper pouch, or attach the removable shoulder strap to easily turn it into a cross-body bag. Our protective and durable bicycle pannier bags are the ultimate solution for a great ride. This front frame bike bag features secure velcro straps that can be adjusted to fit almost any bicycle or motorcycle. 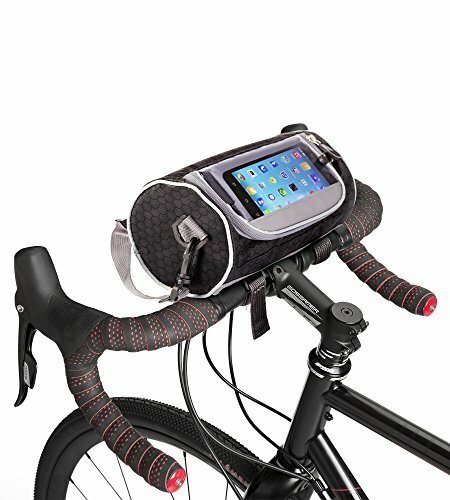 Crafted from durable waterproof materials and fully lined with shock-resistant padding, this phone handlebar bag protects your devices and travel accessories from harsh weather and crashes. Safe for high speeds, steep or rocky terrain, and wet conditions - this versatile pouch is a convenient solution for mountain bikes, road bikes, motorcycles and mopeds. Touchscreen smartphone pocket measures 6.3" x 5.1" and is compatible with most Apple and Android devices. Storage Pouch: 8.9" x 5.1"
Smartphone Pocket: 6.3" x 5.1"
✅ UPGRADE YOUR RIDE - Enhance your riding experience with this bike handlebar bag! While other bike panniers are hard to reach and interfere with cycling, this bag's sleek design keeps it away from the gears and gives you easy-access to your device. ✅ TOUCH-SCREEN VIEWING - Access GPS and Google maps to keep track of your route and explore new terrain, safely listen to music, or make hands-free calls! Clear phone bike pouch protects your device and is compatible with most Apple and Android phones. ✅ PROTECT AGAINST WEATHER & FALLS - Cycling across rocky terrain, cruising on your motorcycle, or road biking in damp conditions? This waterproof motorcycle handlebar bag protects your device and accessories from harsh weather conditions or crashes. ✅ EASILY INSTALL ON ANY BIKE - This quick release handlebar bag features adjustable velcro straps to hold the pack securely to your bike frame. Easy to install and remove, this front pouch bag fits most bikes & motorcycles and is safe for high speeds. ✅ GOING THE EXTRA MILE MATTERS - Spacious interior is ideal for holding cameras, sunscreen, snacks, or a bike repair kit. With a removable shoulder strap, this front bike frame bag doubles as a travel purse, so you can be ready for that extra mile. If you have any questions about this product by Boxiki travel, contact us by completing and submitting the form below. If you are looking for a specif part number, please include it with your message.